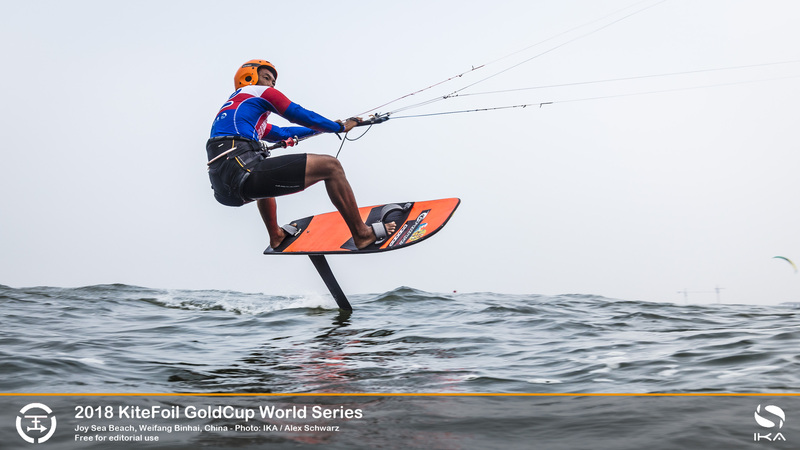 British athlete Guy Bridge charged up the leaderboard on the third day of the KiteFoil World Series at Weifang Binhai, in eastern China, with scintillatingly-quick and accomplished racing that earned him a hat-trick wins. The wins catapulted Bridge, the younger sibling of Olly Bridge, up the rankings to third spot overall on a day of confusingly-mixed conditions that finally came good late in the afternoon, enabling the race director to squeeze in four races. 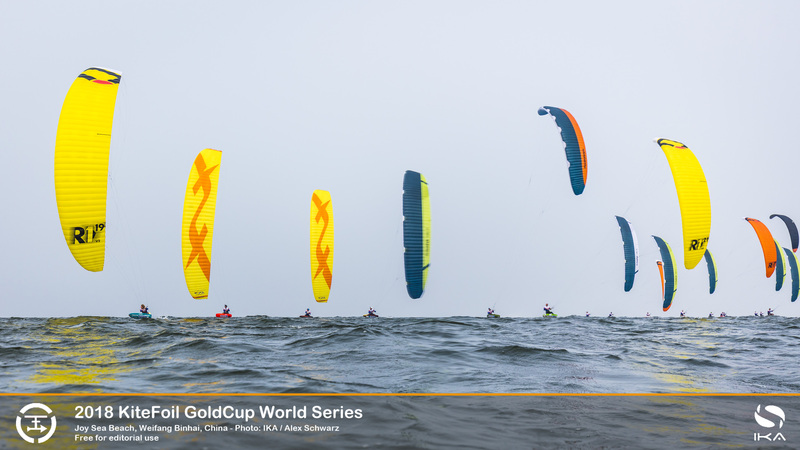 Bridge’s stellar outing on the two laps of the windward-leeward track on the Yellow Sea in 13kts to 18kts boosted his quest for overall victory at the International Kiteboarding Association (IKA) KiteFoil World Series season opener. But almost as important for Bridge was that with the mounting number of races he was able to discard from his tally another poor early score caused by a retirement for a broken line that had been costing him dearly. Still, fellow countryman Connor Bainbridge did enough on the third of the five-day regatta to hold his spot at the head of the order, though he suffered an expensive tangle with French racer Théo de Ramecourt in the final race of the day. Multiple world champion Maxime Nocher (MON) again had another strong day in the shifty, onshore breezes that only filled in after violent squall blew over the track as racers were held on the beach. In what were ultimately excellent racing conditions, Nocher notched up three second places as he battled Bridge around the course, enough to cement his second spot overall. Yet with two more days of racing scheduled at the Weifang World Series regatta—where prize money of €60,000 is up for grabs—all the racers in the 32-strong fleet from 16 nations realise everything is still to play for. 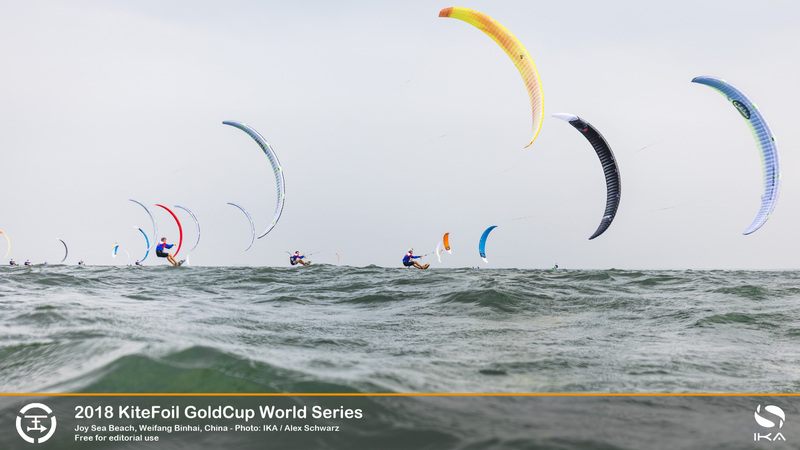 Next week many of the fleet will travel south to Fujian province’s Pingtan island for the second of four scheduled KiteFoil World Series stops to crown the IKA KiteFoil World Champion. The reigning world champion, France’s Nico Parlier, slipped a place to fourth overall after he suffered the misfortune of missing the day’s first race when he went to change wet clothes after the rain squall, unaware the start was imminent. But it was the younger Bridge who set the scorching pace on his 15m kite, when rivals chose larger 18m or 19m kites. His first race did not go so well, when he could only manage a fifth after hitting some debris and crashing. But afterwards he did not look back. Nocher enjoyed his duels with Bridge and is equally happy he is rediscovering the kind of form that has helped him capture so many world titles over the years. 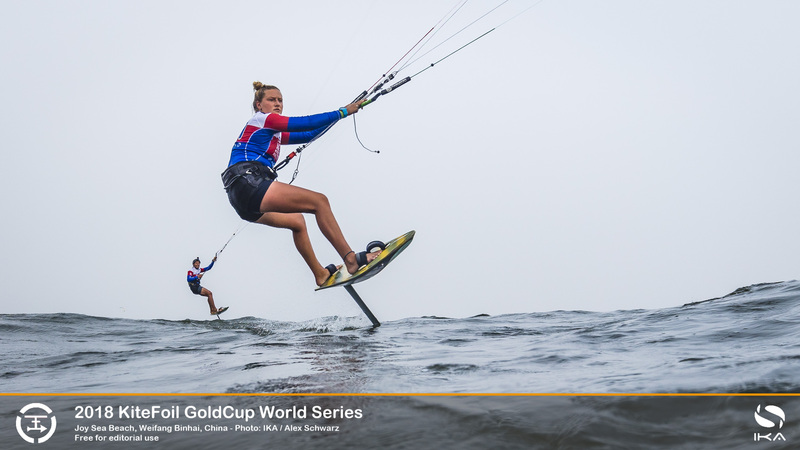 In the women’s group, racing with the men, three-time Formula Kite World Champion Daniela Moroz (USA), is more than holding her own. She sits in the middle of the extremely strong fleet and is learning a lot.